These dark words are spoken by the closest thing 77 SHADOW STREET has to a narrator --- an ancient evil that inhabits the very essence of the former mansion house on Shadow Hill. Now called the Pendleton and long since converted into luxury apartments, this infamous place known for acts of madness, suicide, murder and much, much worse is ready to have its dark host reawaken for an act of terror that always seems to arrive in 38-year intervals. This time, the 2011 inhabitants of the Pendleton will not be prepared for what “the One” has in store for them. 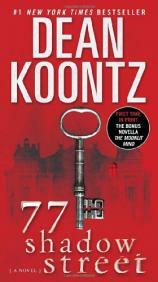 "Koontz has pulled out all the stops and firmly grasps hold of the horror mantle that put him on the map. This chilling and deeply satisfying novel will linger with you long after the final page is turned." Originally constructed in the 1800s during a Gilded Age in California, the eccentric tycoon who built the grandiose home located at 77 Shadow Street never realized that its location was right on top of a strange vortex. It quickly became a portal between worlds --- one of unwitting humans whose weaknesses were easily exploited by the demonic presence from a much darker realm that is bent on the destruction of all humanity. Taking the moniker “the One,” this evil entity appears to have a tireless desire to complete its ultimate goal of mass destruction. The only question is why the One’s power only seems to come to fruition every 38 years. Converted in the 1970s to the luxury apartment house now called the Pendleton, the history of the property precedes itself. For the most part, the current occupants of 77 Shadow Street simply enjoy the luxurious amenities the old-fashioned apartment house provides them, as well as the view of the city below. Suddenly and without warning, 2011 marks 38 years from the last tragic act at this location. Shadows begin to cross the walls, eerie lights emit from the furnace and freight elevator, security cameras pick up horrific scenes of not-quite-human beings lurking around every corner, and the One begins to communicate with the residents through their TV sets. The inhabitants are a fairly close-knit group and represent all walks of life: a successful songwriter and her son, a disgraced ex-U.S. Senator, a war hero, a widowed attorney, an ambitious money manager, a pair of elderly sisters who run their own business from their apartment, and a highly acute autistic girl. These characters and several others will soon be pitted against an enemy they cannot possibly understand who will physically use them for its evil agenda. When the One propels the entire Pendleton into a desolate futuristic and isolated landscape, the heroes of the Pendleton are literally taken out of their element and forced to face their own fears as well as the uncertainty of what unspeakable fate may be in store for them. 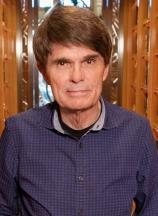 A few years back, author Dean Koontz suffered a near-death experience. Clearly this impacted his writing style, and many of his books published since then had at their core an air of new-age spirituality that was quite unlike the Horror Master who had been scaring the heck out of readers since the early 1970s. As a fan of his work since the beginning, I admit to doubting that the “old” Koontz I grew to know and love would ever return. Last year, my faith was renewed with the release of the terrific serial-killer horror novel WHAT THE NIGHT KNOWS. Now, with his annual winter release, 77 SHADOW STREET propels him firmly back into his horror beginnings. It is dark and pays homage to both his previous work (PHANTOMS comes to mind), as well as classic haunted hotel novels like Stephen King’s THE SHINING. In books like PHANTOMS and THE TAKING, Koontz has shown a penchant for developing a villain of ancient evil that represents a possible explanation for Roanoke-like mass disappearances of human beings. I particularly enjoyed how the evil voice that shouted from the Pendleton’s loudspeaker repeated over and over “exterminate, exterminate!” I’m sure this was not a mere coincidence in calling to mind the evil race of Dalek’s from the “Dr. Who” series on the BBC. Koontz has pulled out all the stops and firmly grasps hold of the horror mantle that put him on the map. This chilling and deeply satisfying novel will linger with you long after the final page is turned.